2017 Topps Update Series Baseball ($64.95 Hobby Boxes & $114.95 HTA JUMBO Boxes) arrives Wednesday, October 18th at Sports Cards Plus. As is the tradition, rookies who debuted early in the year and traded players are focal points for the checklist. While many elements from 2017 Topps Series 1 and Series 2 carry over to the de facto third set, there are some new angles as well. One of the carry overs is the number of hits in boxes. Regular hobby boxes have either an autograph, memorabilia or manufactured relic. Hobby jumbo boxes have an autograph plus a pair of memorabilia or manu-relics. 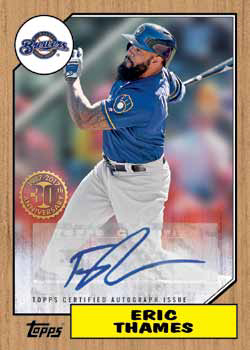 The 2017 Topps Update Series base set has 300 cards. Although numbered separately from Series 1 and Series 2, when taken as a whole, it brings the line up to 1,000 cards for the year. 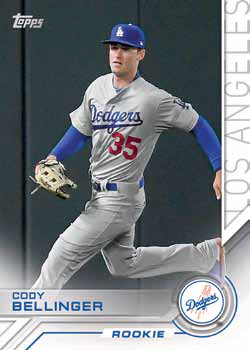 The main player cards encompass veterans on new teams as well as rookie call-ups from the opening weeks of the season. Although the set releases following the close of the regular season, checklists are determined often several months in advance. That means that players making their debut later in the season are usually held back until the following year’s Series 1. Other subsets include Season Highlights and cards from the 2017 All-Star Game and accompanying Home Run Derby. 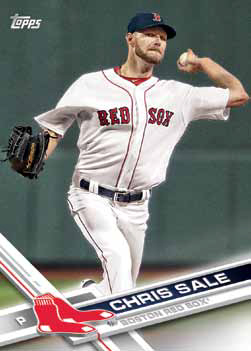 Select cards also have variation short prints and variation autographs. Like the earlier sets, 2017 Topps Update Series Baseball has plenty of parallels. On the more common end are Rainbow Foil (1:10 packs) and Gold (/2017). Other serial-numbered parallels include Negative, Black (/66), Father’s Day Powder Blue (/50), Mother’s Day Hot Pink (/50), Memorial Day (/25), Printing Plates (1/1) and Platinum (1/1). Black and Negative parallels are exclusive to hobby and hobby jumbo packs. On top of these, select players have Clear parallels that are numbered to 10. Regular hobby packs (not jumbo) are the place to find them. The familiar wood borders of 1987 Topps (1:8 packs) are back for another round of inserts, carrying on from the ones included in Series 1 and 2. Sticking with the Update theme, players included this time around are primarily a mix of rookies and traded players. 1987 Topps Red parallels are numbered to 25 while Platinum versions are one-of-ones. 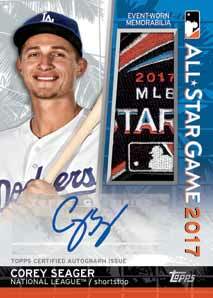 Topps Salute (1:8) is another insert set carrying on in 2017 Topps Update Series Baseball. Subsets of the highlight-driven set include debuts, walk-offs, spectacular plays and dominant games on the mound. The year-long MLB Network insert set (1:36) wraps up with another group of hosts and personalities. 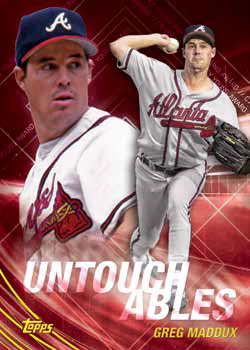 Untouchables (1:8) is all about great pitchers throughout history. 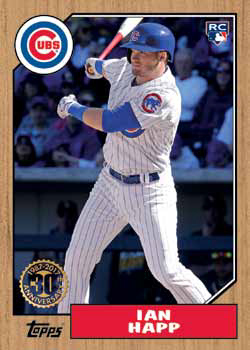 Topps All-Rookie Cup (1:8) reprints cards from the past that have the company’s All-Star Rookie award. Hank Aaron Award Commemorative Patch cards make up the manufactured relic content available in hobby and hobby jumbo boxes. The checklist features players who have won the award for being the top hitter in each league. Parallels include Gold (/99), Black (/50) and Platinum (1/1). Select cards also have autographed versions. 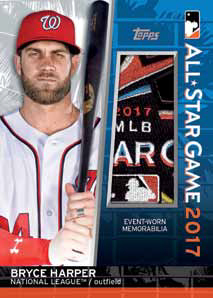 As has been the case for many years, the annual MLB All-Star Game is the centerpiece of the Update Series memorabilia offerings. All-Star Stitches makes up the bulk of these. Basic versions have Gold (/50), Orange (/25) and Platinum (1/1) parallels. Select autographed versions are numbered no higher than 25 and have Orange (/10 or less) and Platinum (1/1) parallels). All-Star Stitches Dual and Triple cards feature multiple players. All are numbered to 25. Some of the All-Star Stitches Dual cards have autographed versions numbered to 25 or less. 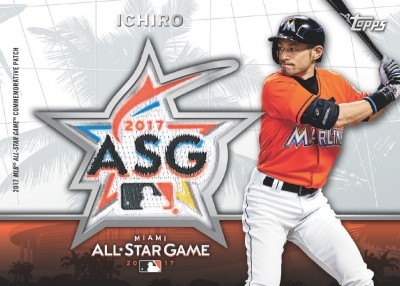 All-Star Jumbo Patch cards have no more than five copies each. These come with a piece of the American or National League patch, depending on what league they play for. Autographed versions are numbered to 10 or less. Own the Name Relics are back for another year. Numbered 1/1, these come with a full letter piece from a jersey’s nameplate. Topps Salute and 1987 Topps both have autographed versions to go with the regular inserts. For Topps Salute, there are Red (/10 or less) and Platinum (1/1) parallels). Although the majority of autograph cards in 2017 Topps Update Series Baseball use stickers, some (but not all) of the 1987 Topps Autographs come on-card. Parallels come in Glossy (/15 or less), Wood (/10), Ash Wood (/5) and Birch Wood (1/1). Rare Cut Signatures are inserted. All are one-of-ones.